The Home Trust (HTI): What first compelled you to enter your business field? Thomas Reiner (TR): Besides being a trained furniture restorer, I always kept an open eye on certain qualities that historical architecture incorporates. Therefore the beauty as well as the unique character of antique building materials soon led to the business I find myself in today. I am using my knowledge as a restorer to bring back the beauty and regain the aura of our parquets. This comes close to restoring antique furniture, but even surpasses it since most of the floors I encounter are in quite a neglected state. The ‘before and after’ images on my site reflect our work. TR: The quality and the detailed craftsmanship of historical production still surprises me today. Besides that I try to spend as most time as possible to follow my first great affection which is music. HTI: Music is your first love? What type of music or who are the artists? HTI: What is the best advice you ever received? TR: To start with something when everybody else still thinks it is nonsense, and even more important to believe and stick to that plan. I think in regards to my company it is proven that my consistency paid off. HTI: One a personal level, are you the same person at home as you’re known by your colleagues and industry? TR: Yes; definitely. I couldn’t think about anything else than keeping things original. TR: If you ask me about my perception of quality in general, I’d say it’s the right blend of perfection, passion and patience! Well when it comes to my products, I am proud to say that every single panel of antique parquet looked quite different before my team & I lay our hands on it. HTI: In what ways has your company or industry changed over the years? TR: I soon found myself as the person holding the greatest variety of different antique parquets and patterns worldwide. So gladly I’ve been seeing a constant rise in attention that my expertise in restoring in situ. Also, our collection highlights our ability to restore parquets is able to achieve by now. HTI: What book(s) are you currently reading and/or Do you have a favorite book or author? TR: Königliches Parkett von H. Michaelsen, (a recent one on the history of parquet laying in Prussia). There are actually too many that I could single one out! By the way Antique Parquet along with the Austrian Monumental Protection are currently planning a book of our own: it will be about the richness, quality and variety of parquets in the former Austrian Empire. HTI: Do you have a favorite city or place you like to travel? HTI: When you’re not working, where are most likely to be found? HTI: What is your favorite object that reflects extraordinary design and why? TR: Historical architecture and buildings in general. The balance of proportions. TR: Generally, it is the way how people combine and select the various ‚ingredients of their chosen surrounding. TR: Besides perfection? Certainly a talent for improvisation and being able to keep just the right amount of flexibility! HTI: Why are you a partner in The Home Trust International? 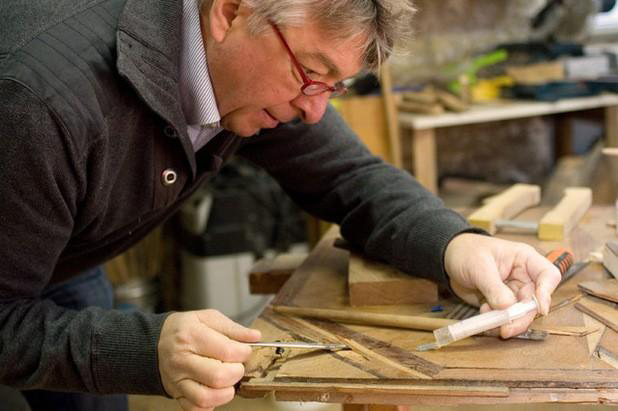 Thomas Reiner is the founder and president of Antique Parquet; the world’s renowned provider of antique hardwood floors. Reiner restores the floors from castles and palaces of princes, kings and emperors from another time. His collection of antique handmade floors is the largest in the world. Based in Austria, Reiner serves Interior Designers and privileged clients worldwide.